In Christ, God was reconciling the world to Himself, not counting their trespasses against them, and entrusting to us the message of reconciliation. The moral qualities of God are absolute, and He makes them known. 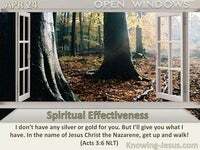 His attributes are expressed in His Word, and they make their demands. One attribute does not negate another, but each compliment the other. Each aspect reflects the Lord’s glory, like the surface of a multi-faced diamond. Mercy and Truth meet and are linked together in His eternal embrace. Righteousness and Peace are joined in God’s profound Love and Grace. Mercy is disposed to Clemency and Pardon. Truth is linked with Justice and Punishment. 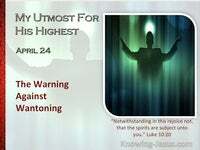 Righteousness must maintain the blameless One, yet judge the sinful one. Peace would rejoice in Forgiveness and Grace – all have their roots in the Love, Tenderness and Intimacy of the Eternal One. As members of the human race we are made in the image of God, through Adam. As blood-bought believers we are redeemed by Him, through Christ Jesus. 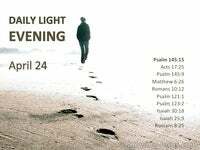 As His children we are being conformed into the image of His Beloved Son. But how often these attributes of the Lord God appear to be in opposition. How frequently we regard them as opposite in nature and in expression. How many times do the complimentary characteristics and moral qualities of God create an inward tension by their demands in the heart of the believer! We long to forgive the offender.. but we must maintain the rule of house. We would like to bypass the fault.. but to do so would countenance lawlessness and cause confusion. We desire for the judgment to be meted out.. and yet we know the heart of God towards all His creation. Some hammer away at Truth alone, while others become submerged in Mercy. Some call down the fires of Judgment while others bathe only in Peace. Some err on the one side, whilst others sway to an opposite boundary. In both cases the reaction is a distorted God, embracing a lopsided bias. Precious few can simultaneously maintain truth and show mercy. Limited numbers are able to examine self and identify their own prejudices. 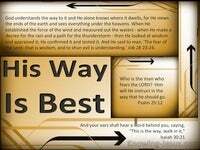 Yet most believe that their way is the best way. Most believe that theirs is the only way to behave. Most consider that they have the right balance in thought, word and deed . Are you like that? Am I? However, there is no tension in the contrasting attributes of the Godhead. There are no contradicting aspects in God’s own moral qualities, for each attribute is perfect and each quality is eternal. Contradictory demands are united together in the extremity of His understanding. The three-fold cord of the Holy Trinity is as unbreakable as it is eternal. He it was that undertook to represent both God and man. 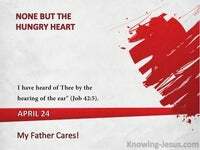 He it was that both declared the chastisement and bore its pain and shame. This height and depth of the great truth of Christ’s reconciling work.. is beyond our foolish comprehension. This enormous wonder of the uniting of all His attributes for our eternal good.. is more than the human mind can fathom. The wonders of redemption and the glories of heir-ship with Christ.. plumb the depths of our grasp and scale the heights of our imaginations. 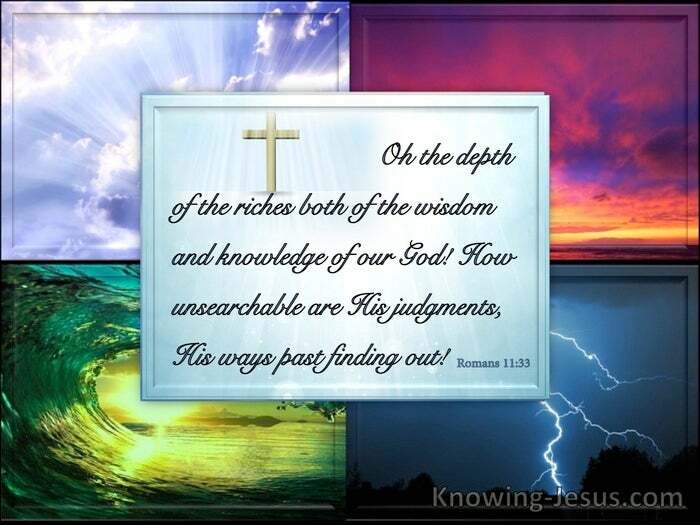 O the depth of the riches both of the wisdom and knowledge of God! 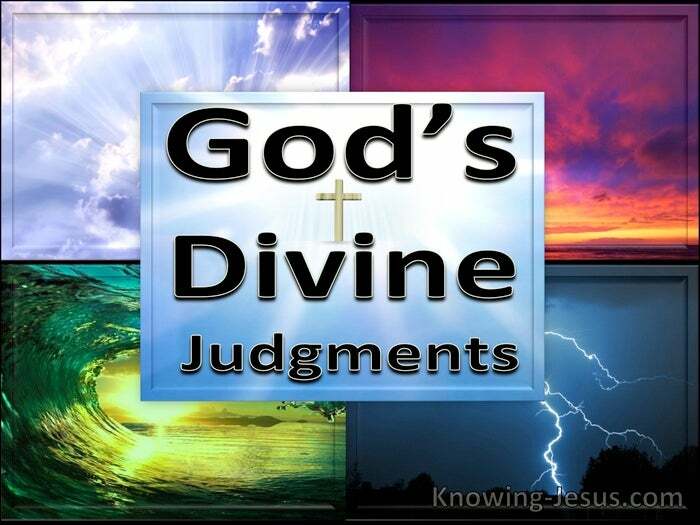 How unsearchable are His judgments, and His ways past finding out! Romans 11:33.